New ROBLOX Visor > Old ROBLOX Visor | Roblox Direct!! 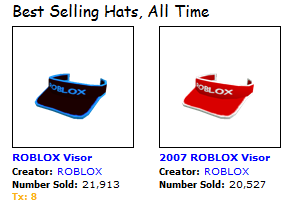 It’s official, the new ROBLOX Visor is selling better than the 2007 ROBLOX Visor. Just look. In 2 Years, consider the 2007 ROBLOX Visor as a collector’s item.